What Does Thwink.org Have to Offer? Home > General > Getting to Know Thwink.org > What Does Thwink.org Have to Offer? If you know where the bullseye is, your solutions can't miss. 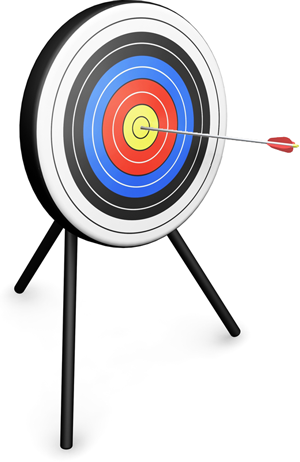 The bullseye is the root causes, which are found by root cause analysis. To get this right we've developed three new pieces of technology with intrinsic, easy to use power. These correspond to the first three menu dropdowns on the big blue arrow at the top of every page. The fourth dropdown is the payoff: solutions that work. If you have found the root causes and their high leverage points, used that knowledge to converge on solution elements, and then experimentally tested your solutions, then you will hit the bullseye. The global sustainability problem is so novel, huge, and complex it has stumped millions of problem solvers for over forty years now. Why? Because environmentalists have attempted to solve a radically new problem with antiquated old methods. To fill this void Thwink has engineered a new approach to solving the problem. 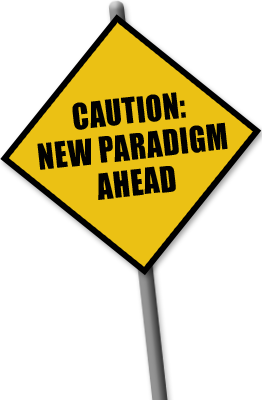 It's so different it qualifies as a new paradigm. See Mastering the Science of Striking at the Root if you are thirsting to bust out of the old paradigm into a new one. We offer one main working tool: the System Improvement Process. This incorporates a host of smaller tools, concepts, principles, and definitions. 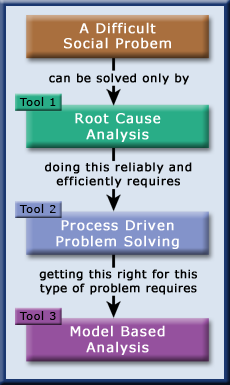 The System Improvement Process is a wrapper for Root Cause Analysis. 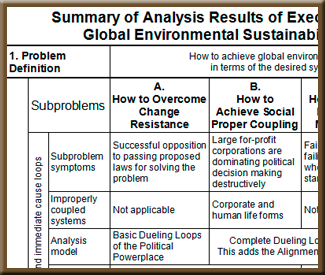 The wrapper allows Root Cause Analysis to be routinely applied to difficult social system problems, such as sustainability. Root Cause Analysis works extraordinarily well for business, so with the right wrapper it can do the same for public interest activism. If you're taking a broad, deep approach and wish to base your work on Root Cause Analysis, then dive into our analysis. There you will find subproblems, root causes, high leverage points, and all sorts of insights that can give you entirely new ideas. 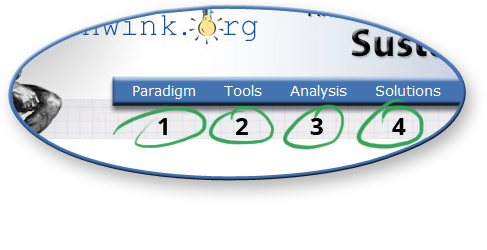 The Thwink analysis can be used as a starting point for your own analysis, which can save considerable time. See the Summary of Analysis Results to get the big picture. If you're tired of solutions that don't work or want to research some of the latest leading edge ideas for solutions that are much more likely to work, then explore our sample solutions. Altogether there are 12 solution elements. This is what it takes to resolve the 4 root causes found in the analysis. See the Summary of Solution Elements to get started. 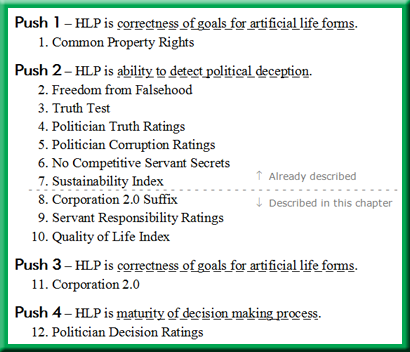 The list of solution elements is from the Common Property Rights book. The rest of the menu items support the above four main assets. Not to be missed is the Glossary. This contains 60 terms that, once understood, form the language of the new paradigm that is so necessary to solve the sustainability problem. The place to start is Mastering the Science of Striking at the Root. The first thing a good doctor does is find the symptoms of the illness. The second is find the root causes, which requires examination and testing. Only after the root causes are found does the doctor prescribe a treatment. If the diagnosis is correct the treatment will usually work. If the diagnosis is wrong the treatment will usually fail and will often make the problem worse. If this basic process works for the science of medicine it can work for sustainability. We just need to fine tune the process so that it fits the problem. (1) "Every time" may sound like hype but it's not. The hard sciences like physics, biology, medicine, and countless branches of engineering solve their central problems routinely. They do this with a foundational framework that works. The soft science of sustainability has long lacked such a foundation. That why popular solutions have failed for over forty years. That's why the planet's Ecological Footprint keeps steadily rising, no matter what solutions environmentalist try. Why do popular solutions fail? Because they do not resolve root causes. The above assets provide a foundational framework that can change that overnight. In your hands the framework can find and resolve the root causes at last. 1. All problems arise from their root causes. 2. The process must fit the problem. All the hard sciences were once soft. One by one, each discovered and perfected its foundation and moved from soft to hard, from Prescience to Normal Science. Why can't the science of sustainability be next?